Spectro Analytical Instruments recently introduced a new inductively coupled plasma/optical emission spectrometry (ICP-OES) analyzer for routine analyses in environmental and agronomy applications as well as petrochemicals, consumer product safety, pharmaceuticals, chemicals and foods. The SpectroGreen analyzer incorporates a low-purge optic design and requires no added cooling, thus eliminating the need for external chillers. The analysis can determine trace elements and handle samples with challenging matrices, including wastewater, soil and sludge, as well as samples containing industrial chemicals, high salt content or metals. The Dual Side-On Interface (DSOI) technology employs a vertical plasma torch, observed via a new direct radial-view technology. Two optical interfaces capture emitted light from both sides of the plasma, using a single extra reflection for added sensitivity and elimination of issues plaguing newer vertical-torch, dual-view models. The ORCA optical technology is intended to maximize light throughput, stability and sensitivity. Access to the entire wavelength range with a single analysis eliminates the need to choose a viewing mode or make multiple analyses. A readout system boosts spectra processing and transport speeds for faster analysis speeds, shorter sample-to-sample times and more samples per hour. The new generator also helps analyze difficult sample matrices in lower dilutions to lower limits of detection while staying cool and trouble-free. The analyzer’s compact design offers a short, optimized fluid path and a footprint that occupies less benchtop depth, with space in front for a small autosampler. The operating software is engineered to offer an easy-to-use experience. Streamlined workflows are backed by a modular plug-in architecture to customize the interface for each user’s needs. Processing speeds are up to 1,500 times faster than previous database systems. Version and user management, combined with audit trail functionalities, make the analysis process fully transparent and traceable. 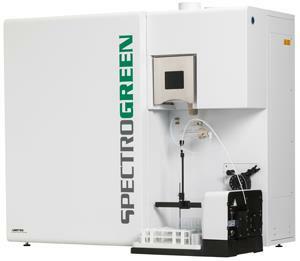 For more information, visit www.spectro.com.